I've been a little obsessed with sleeve garters lately, though I must admit I wasn't fully sure why men of the 19th century rocked the upper arm elastic band. Figured it had to do something with sleeve length, and so it does: Sleeves were one-size-fits-all back in the day, and the garters helped men customize their shirts in a way that allowed their cuffs to stay neat and clean. 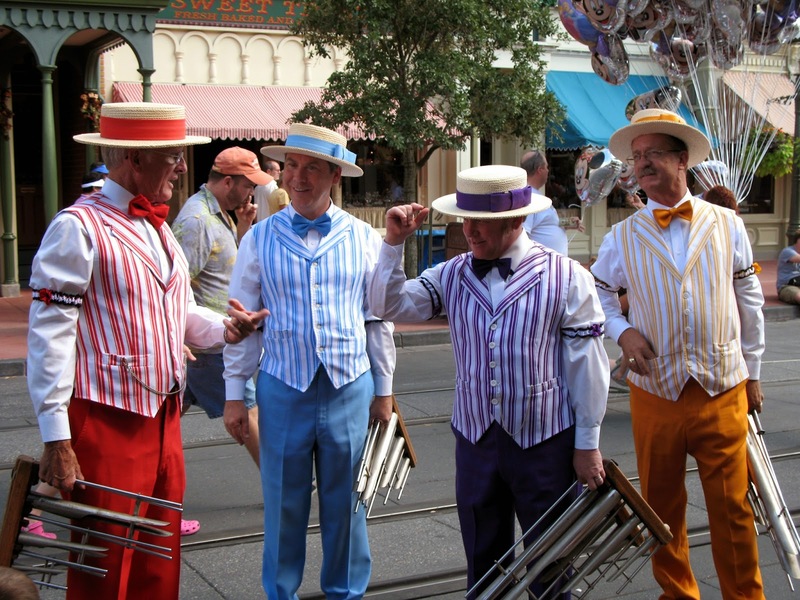 Now garters are purely decorative, and sometimes costume-cute, as when they appear on the barbershop quartet in Disneyland. I'm fairly sure I'd never put a sleeve garter in the world o' Wilfair, though snoods and evening gloves have reigned, so I could be persuaded. A certain old-timey style has been popular in historic Los Angeles bars over the last few years, and the gentlemen making the drinks all rock sleeve garters and waxed mustaches and crisp collars and, very often, Brylcreemed hair and interesting tattoos. Gotta say, the sleeve garters, and the whole look, work. It's quite handsome. Especially when they throw an extra cherry in the Shirley Temple I've ordered (or Manhattan -- I've got wide-ranging tastes, or so I like to think). Now, if only a bar in town had a special Shirley Temple menu, with different variations on the sweet drink. That's next for a future Finley hotel, and sleeve garters for all the staff.